yesterday odetta died. 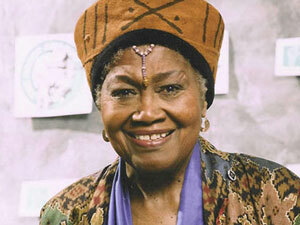 odetta is considered the voice of the civil rights movement. it is wonderful to know that she lived long enough to see the election of our first africian-american president. it is sad that she was 'called home' before she could attended obama's inauguration - and you know she would have been there - oh to have her singing at that party - she would have loved it! the story I heard this morning on npr said she was performing right until the day before she died. for as long as I can remember odetta has been in the forefront of the struggle for human rights - giving her voice, hands and all. They're all leaving us, with nary a soul to take their place. What people like her saw and lived through, although still occurring, it's to a different degree to be sure. I have one song she did that I need to find on a compilation cd I made. It was another one of those I had never hear her do, but was stuck by how she sang it. I remember my mother had her recordings, on Vanguard, maybe? I hadn't realized she'd died until your post. yes, cm, nary a soul to be sure. And mouse, I'm catching your cold, I think. Oh man. I had not heard this either. some lady. Peace to her soul. no one will replace her, for sure, but when the old ones move on, younger ones rise up. They're out there, all around, for sure. Coffee said what I was thinking. Who will replace these voices? Another angel removed from the earth.